In the Canadian province of Ontario, near the port city of Hamilton are several amazing natural wonders that attract thousands of tourists annually from around the world. Arranged a short distance from each other, here you can see incredibly the beautiful waterfalls Devils Punchbowl, Albion Falls, Felker Falls, Webster Falls and the record high - Tews Falls. This attractive waterfall is located in Spencer Gorge River, within the zone Greensville. 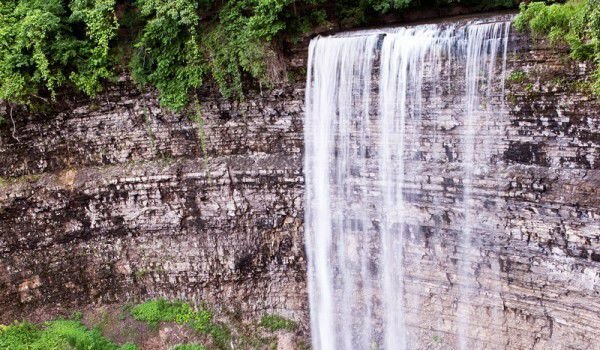 Tews Falls reaches a height of 41 meters, which automatically makes it the tallest waterfall in Hamilton. It is also known by the names Hopkins and Tunisia, but Tews remains the most popular name. Tews waterfall is located just a short distance from the Webster rock. In 2003, the Falling Waters of Tews won the award for best landscaped waterfall. The reason for the distinction is that in 2002 the waterfall was only a trickle, which was not even worth a shot, but in 2003 it became a kind of miracle of nature. From the majestic waterfall Tews, Webster can be reached via a pleasant 30 minute walk along the Bruce Trail, which is the main trail in this protected natural area. If you do not walk, you might end up to the fountain after only a 5 minute drive down the rough roads of the Greensville area. Tews beautiful water jet ís powered by the small Logie's Creek. Its waters descend with the greatest force in the spring when its water is high. During the summer months, Tews waterfall tends to be less impressive. To reach the fountain, you will need to step briefly into a small creek that flows into the River Spencer. You need to be careful because sometimes the currents are strong and the rocks - slippery. On the east side of the creek is the base of the Tews waterfall. There is also a lower waterfall, which can be seen a little southeast of the main natural attraction. It reaches a height of 12 meters and its width is about 22 meters. In the area of the waterfall Tews are located several places to picnic, rock climb and enjoy all sorts of outdoor recreation.